Here at Microsoft, our mission is to empower every person and every organization on the planet to achieve more. We know that with the right tools, anyone can achieve anything. Search, and specifically, Bing, is one of those essential tools. It’s the intelligence that makes sense of the vast amount of information available to us today, and it’s about to get even better. Today, I’d like to introduce you to the new Bing Network. At Bing, we’re building a platform that gives people “knowledge for doing” in a more natural, predictive and personal way. It’s the intelligence that spans not just across Microsoft products but across platforms and across partners. Bing Network connects you to the moments that matter by being in the products people use every day. With the transition of all U.S. accounts (and with them, people and account management) from Yahoo to Bing, the Bing Network also represents an expanded network of partners, including AOL, The Wall Street Journal and more, adding more searches and clicks to the network every day. Bing is in places you never expected and allows you to reach unique audiences where, when and how they want to be reached. In fact, did you know that the Bing Network includes 60 million searchers that can only be found here? A quarter of our clicks come from searches that are exclusive to the Bing Network, and that includes unique searches versus Google. That’s exclusivity that can’t be beat. 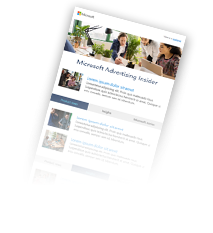 With the momentum of Windows 10, and the growth of our syndication business – including partners like AOL, GumTree, Wall Street Journal and Infospace – we’re adding more searches and clicks to our network; our syndication business continues to deliver high quality volume (over four to five times) compared to just a year ago. Based on your feedback, we’ve built campaign management tools, like the Bing Ads iOS and Android apps, and a soon-to-be-introduced Bing Ads Editor for Mac. We’ve created Bing Shopping and Automated Rules to make it easier to buy on our platform. And, with your input, established the foundation for Remarketing (Audience Buying) that you and much of the industry have been asking for. Want more out of Bing? You have the backing of account coordinators to manage administrative and tactical needs and if you’re looking for key insights into any aspect of your business, we’re there for you. You can see Bing’s intelligence powering some of Microsoft’s most exciting innovations, from Cortana to voice search in Xbox One, and from the search experiences in Windows 10 (which is already on more than 200 million devices) to searching directly in Office. But Bing isn’t limited to Microsoft. Industry leaders trust their most valuable assets -- their users -- to Bing. Whether it’s search inside of Amazon’s devices, web results for Siri and Spotlight Search on Apple devices, or maps on thousands of leading websites, Bing’s technology is increasingly being adopted across the industry. The Bing of today looks a lot different than it did when we started six years ago. With this in mind, you will see changes to how the Bing brand looks, including a new logo, photography style and color. We are excited about these changes, as it also marks an important period of time in our business.